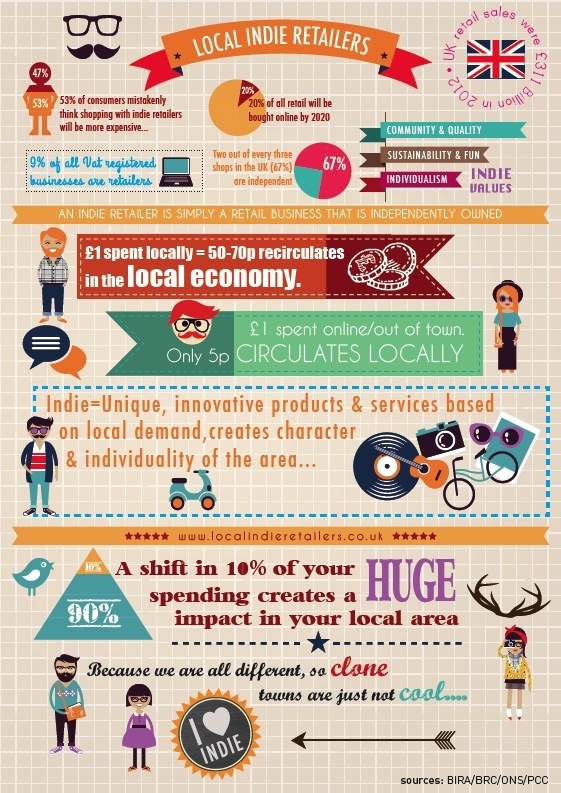 I love infographics like this one which lays out well the economics of local vs national retailing. Some time ago I described in a blog my vision for the perfect market town http://ashbournevoice.co.uk/2013/11/10/the-perfect-market-town-a-vision/. As our daughter is at Hull University we have had the opportunity to regularly visit Beverley in East Yorkshire. On the first occasion, on a cold January Saturday, there were queues to get in and out of car parks at 3pm. Beverley is an attractive town centre with Georgian houses and a large, pretty market square. It is about twenty minutes drive from a large City but essentially it is in an agricultural area. It does have a large tourist attraction with the looming Minster and an occasional attraction with the racecourse on the outskirts. The countryside around is unspectacular though. There are some nice little villages but the landscape Is featureless. The centre of the town is largely pedestrianised. Once you are parked it is relatively easy to navigate. The town centre itself is very compact. What I was impressed with was the balance of the high street though. In a medium-sized town they were punching well above their weight with high street brands – M&S Food, Laura Ashley, Joules, White Stuff, Lakeland and Claire’s. But in amongst the high-end brands they had also managed to have The Works selling discounted books and other lower cost outlets. The units were all a similar size so the ranges were limited compared to a city centre store but they were still there. There’s even a small department store – Browns. Importantly though there was a really good range of independent stores – boutiques, craft shops, vintage shops, innovative selling models, delicatessens. They were on the high street as well as in the fringe alleyways and lanes. There were the usual coffee outlets but also lots of independent cafes with their own niches and to suit all pockets. On the Saturday we visited there were two markets and the through-road was closed to allow it to take place which added to the congestion. They sold fruit and vegetables but also some specialists selling rugs, e-cigarettes, books and bags. It looked, on a cold Saturday in January, thriving. I don’t know the truth of the situation and so I did a little research. In 2009 the East Riding Council conducted a healthcheck Beverley Health Check. This confirmed my thoughts but had some interesting observations too. One of the biggest car parks in the town was provided by the development of a Tesco store. The car park is massive and is free for two hours. It serves the town centre and the Tesco store. We tried this car park but found we couldn’t find a single space free so we moved to a pay car park. This shows good town planning for me. The rise of supermarkets is inevitable but the local authority had ensured the stability of the town was protected and that a significant weakness was addressed (but not solved). Crucially, they clearly valued the economic engine of Beverley and were responsive to the traders’ concerns. The conclusions are interesting too. The recommended plan in 2009’s report was clearly being implemented…there was a coach park clearly signposted and street entertainment was provided and of good quality. There were very few vacant units and if anything the centre seemed to be spreading outwards. The visit showed the importance of an integrated plan and Beverley is a tribute to the East Riding and Town Councils. It also demonstrated that lack of parking is a red herring. If the offer is strong enough people will fight to get to it. We had to search for a good ten minutes and then had a 400m walk after paying for our parking (£5.40 all day in 2014). Our parting comments were that we must do it all again but for longer. Of course, every town has its problems and Beverley is no exception. It is also astonishing the similarity across the country. This article points out the challenges that the need for new housing is facing and a big decision to be made about whether to build a bypass for the town. Their response has been either to expand the town or build a “new town” close by to accommodate the growth needed without affecting the character of Beverley. Simple decisions such as a bypass are irreversible and massively impactful on any town. Interestingly, one solution Beverley are looking at is a Neighbourhood Plan to crystallise the local opinion and control their destiny over the coming years. It would be a crying shame if short term economic pressures were allowed to destroy a success story. Only a clear local appreciation of what they have and concerted political pressure is needed to secure the next twenty years. This entry was posted in Review and tagged Beverley, East Riding Of Yorkshire Council, High Street, Minster, parking, Tesco, tourism, traffic. Bookmark the permalink.